There is a tendency to see things as larger than they are, especially when it comes to wildlife. And memories can grow, as well. One rarely, I think, remembers a hawk or a bear or a spider as smaller than it really was. because there is nothing else they can be. I have seen fishers before, although not often and only once close enough to examine - an adult female that had been killed by a car, retrieved by a biologist, and thoughtfully stored in the refrigerator in my office. Hello. Fishers, in my experience, are somewhat larger than ferrets. These two were much bigger than ferrets. They were very similar in size to large otters! As my mind clickety-clicked through the possibilities - are they both unusually large males? are their winter coats making them appear bigger than they are? - I decided a combination of the open area and bright snow must be distorting my perception. 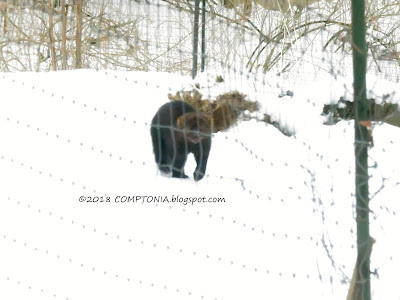 Because, unlike even the muted tones you can see in these images, the high contrast of snow and dark animal meant all I was actually seeing was solid black silhouettes. 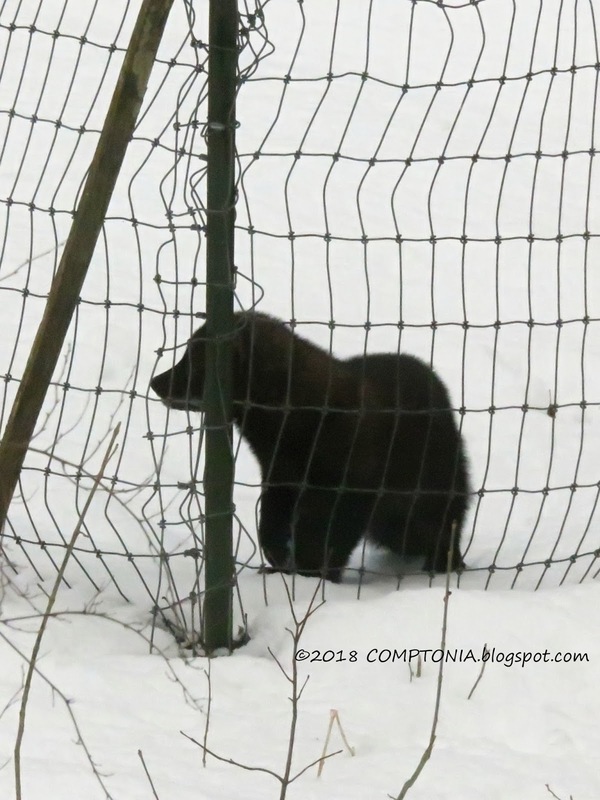 one of the critters began walking straight up to the corner of the fence closest to the house, maybe 15 feet away. And I said, "It can't be a fisher - it's huge!" Normally when something this unusual happens, I focus on paying attention instead of trying to get photographs. 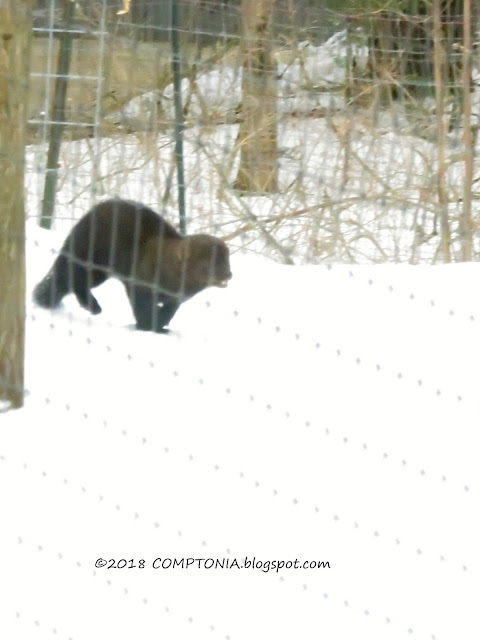 But this time - feeling that my sanity might later be in question - I tried to do both, hence these poor-quality images of two fishers - the first I have ever seen on my property. 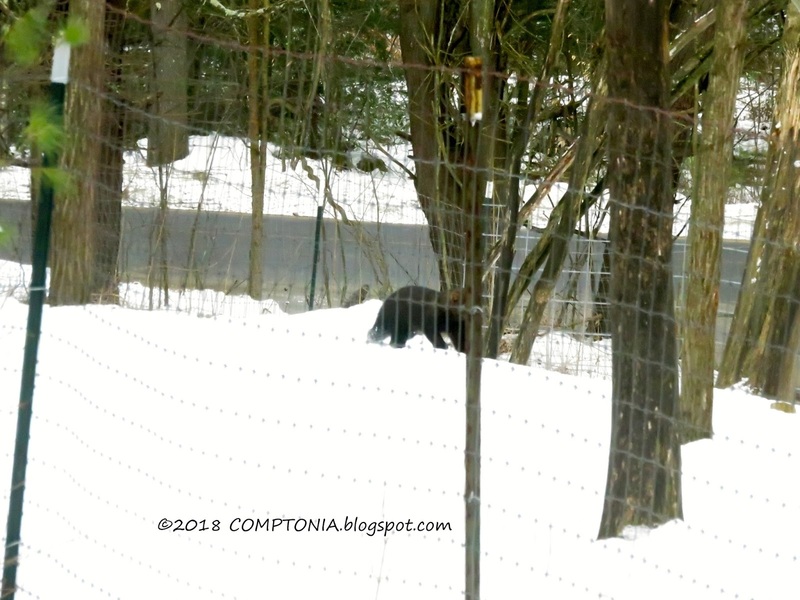 One fisher was startled by something and loped down the paddock and across the road. 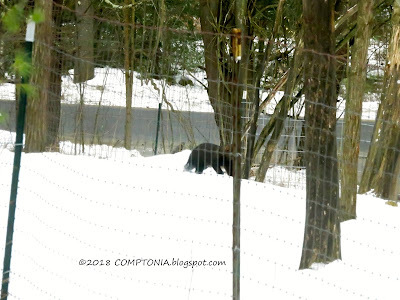 The other ambled around for a while before heading out of sight, up my driveway. 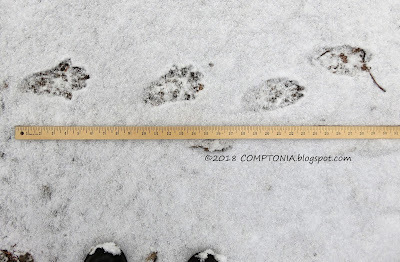 I quickly pulled on boots and went out to look for tracks in the morning's dusting of fresh snow. And found a perfect set. If you imagine a head added to the front and a big tail added to the back of those tracks, you get a pretty good idea of actual animal size. Apparently fishers can be a lot bigger than I thought!